1. 2-pound ham sausage, cut julienne. 2. 2 pound Bologna sausage, cut julienne. 3. 2-pound Swiss cheese, cut julienne. 4. 1 green pepper, whole, sliced paper thin into rings. 4. 4 ounce Bermuda onions, sliced paper thin into rings. 5. 1/3 cup parsley, chopped. 6. 1 cup salad oil. 7. 1/3 cup vinegar, cider salt and pepper to taste. 8. 25 leaves of leaf or romaine lettuce. 9. 3 heads iceberg lettuce, shredded. 10. 25 parsley or watercress sprigs. 1. Place the ham sausage, Bologna sausage, Swiss cheese, green pepper and onion rings in a mixing container. Toss gently. 2. Add the vinegar and salad oil. Toss gently a second time. Season with salt and pepper. 3. Line each cold salad plate with a leaf of lettuce. Sprinkle the shredded iceberg lettuce over the leaf lettuce. 4. 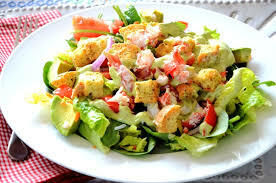 Place a mound of salad in the center of each plate. Top with chopped parsley. 5. Serve with a sprig of parsley or watercress.